The Linux ports of Total War: Shogun 2 [Steam, Feral Store] Fall of the Samurai [Steam, Feral Store] have now been shipped by Feral Interactive. Here's a port report and a review based on gameplay of Shogun 2 itself. Total War: Shogun 2 is a strategy game set in feudal Japan during the 16th century. Japan is fractured into multiple clans, each fighting for power. Your task is to lead one of these clans and eventually become the new shogun of Japan. While Fall of the Samurai is set 400 years later in the 19th century. Before we dive deeper into the gameplay and entertainment value of the game, let’s talk a bit about the technical side to give you an idea of what kind of performance you can expect from the port. Sadly, the game lacks a built-in benchmark and due to the game shipping as a 32-bit binary I was unable to capture frame times with GLXOSD. Due to scheduling problems I wasn’t able to get a 32-bit version of GLXOSD built in time for this port review, so the numbers you will see are not exactly scientific. Nvidia testing was also not done due to problems presented by the proprietary driver, I couldn’t even get Steam running when I installed the 381 driver for my GTX 760. So, I will be sticking to my AMD hardware for this port review. Talking about the hardware, I tested the game on both my desktop (R7 1700 @ 3.7GHz, 16 GB of DDR4 RAM @ 2133MHz and Asus Strix R7 370 4G) and my laptop (A10-9600p @ 2.4GHz, 8 GB of DDR4 RAM @ 2133MHz). The laptop represents a fairly low-end gaming setup whereas the desktop represents a more mid-range option. The game was tested on Antergos with the Linux 4.10 kernel and Mesa 17.1. Since there is no built-in benchmark, I simulated one by loading the Battle of Nagashino, one of the historical scenarios that ships with the game. Note that the average framerates are estimates and these numbers should be taken with maybe more than a grain of salt. Also note that the scenario is quite close to a worst-case scenario and smaller skirmishes run a lot better. On my main gaming rig you can see the game work quite flawlessly on Low settings but the performance does drop off towards Very High. The game appeared to be CPU bound throughout the testing as the measured GPU usage never exceeded 40%. The game can actually be cranked above the Very High settings by manually enabling features such as tessellation and when cranking everything to the very maximum the game was GPU bound, but the framerates were mostly around 10 FPS. The maximum CPU utilization of the 8 core/16 thread Ryzen was 20%, so the game was utilizing up to 4 of the 16 available threads. 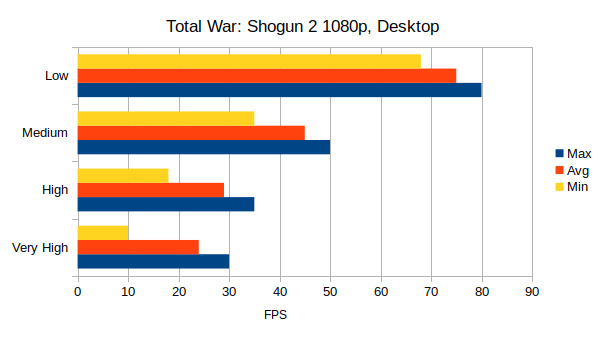 Being a Total War game, Shogun 2 is actually playable even at fairly low framerates, but sub-30 FPS still isn’t that fun to play. On the laptop Very High settings were completely disabled in the options menu and I was only able to test up to High settings. And, as you can see from the results, it’s not really a surprise why the settings only went up to High. While you could argue the game was playable on Medium settings, it wasn’t smooth unless you turned the settings down to Low, where the game started to be more bearable. Interestingly, the game appeared to be CPU bound even on the laptop, as the GPU utilization only went up to 60%. The maximum CPU utilization I saw on the laptop was around 80%, which matches the CPU utilization seen on the Ryzen. 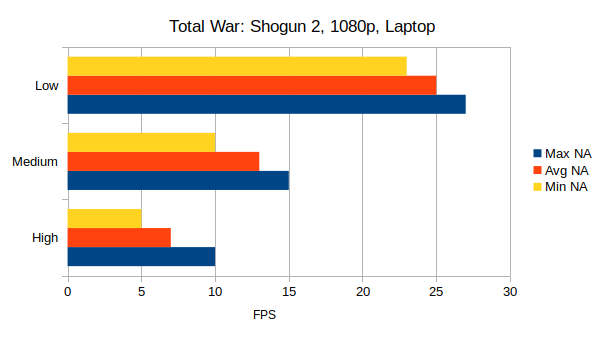 So, in conclusion, Shogun 2 seems to be CPU bound on the setups shown here. I tried monitoring the core utilization using htop and initially on the desktop machine it seemed that not a single core was getting maxed out. However, when checking the processes it seems that Shogun 2 has one thread running at 100% utilization almost all of the time. That process is likely the rendering thread and likely the reason for the CPU bottlenecks seen here. This isn’t too unusual, considering how poorly OpenGL tends to multi-thread. I would however like to stress the point that the performance figures here aren’t what you will see all of the time. I have been playing the game for about 10 hours on the High and Very High settings on my Ryzen machine and the performance is above 30 FPS most of the time. However, when the fights get particularly big and intense, you can definitely expect the game to drop all the way down to 10 FPS. Those that want to play the game in multiplayer should also be aware of the fact that the game does not support cross-platform multiplayer, so you’ll be limited to playing with those using the same operating system. Feral are apparently working on Linux-Mac cross-platform multiplayer but it’s unlikely Linux-Windows multiplayer will be a thing, as it would likely require changes to be made to the Windows version as well. Now that the technical stuff has been dealt with, it’s time for us to talk about the game itself. In the usual Total War style, the gameplay is effectively split up between two modes: the turn-based campaign map and the real-time battlefield combat. On the campaign map you recruit more units, build new buildings in the cities you own and conduct diplomacy and manage your research projects. The campaign map has never been all that special in Total War games and I would say it’s no different in Shogun 2. There isn’t a whole lot of complexity there and usually you are just making sure you have enough financial buildings and trade routes available to support your standing army and with the remaining money you build up your armies and defences for the next conquest. The long-term goal of Shogun 2 is to become powerful enough to defy the current shogunate and then declare yourself the shogun. In Total War style, this means you are given a set of provinces to capture and a deadline by which you should have completed this task. The game does give you quite a bit of time, so you shouldn’t worry too much about the time limit but I still don’t like being rushed. To pull this task of you need to do a little bit of diplomatic balancing. If you gain power too fast and the shogun considers you a threat, they may declare war on you preemptively and probably drag some of the other clans with them. So, setting up some temporary alliances and grabbing power slow and steady seems to be the way to go. The meat of the game is in the real-time combat, which takes place when you encounter an enemy army, assault a city or defend your own cities. You can always let the game play out the battle for you but even the game warns you that you’ll have a higher chance of success if you command the army yourself. Plus, I think it would be weird for you to play a Total War game and ignore the portion that makes up over half of the experience. On the battlefield your task is quite simple: defeat the opposing army or, if defending, wait until the battle timer runs out. Under your command you can have various different kinds of units, ranging from the yari ashigaru, peasants armed with spears all the way to samurai armed with European-made matchlocks. The unit variety gives you quite a bit of freedom in deciding how you want to plan out your battles. I am a very careful strategist and as someone who is quite used to Empire: Total War, I don’t really like to send in loads of melee units into a massive and chaotic brawl, instead preferring to keep my distance and destroy the enemy from afar. That’s partially the reason why I never did all that well in Medieval 2: Total War. In Shogun 2 melee units do play an important role and you should definitely have enough in all of your armies, both offensive and defensive, but thanks to the matchlocks my strategy of shooting at the enemy from a distance while protecting my ranged units with melee formations was at least somewhat effective. Despite having actual firearms in my army, I did encounter quite a few challenges while playing Shogun 2 however. The AI is actually quite good at its job and it will attempt flanking manoeuvrers whenever it sees the opportunity. The AI is also quite vicious and I got surprised by sudden declarations of war more than I did when I played Empire. Graphically Shogun 2 is a clear improvement over something like Empire: Total War. The battlefields look a lot nicer and the graphical effects like heat haze and fog make things look quite beautiful. The visual style of the various icons also has the added benefit of not only fitting the Japanese theme but also being very easy to distinguish from one another. In terms of bugs, graphical or otherwise, I didn’t see a single one during the 10 hours I put into the game. 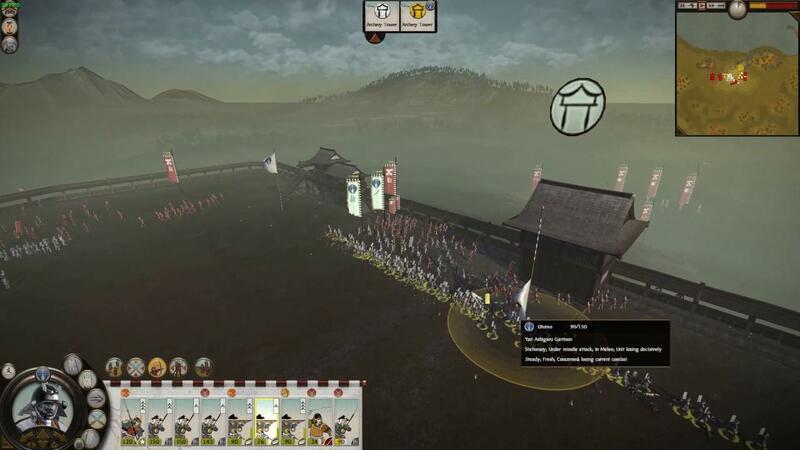 Overall, Total War: Shogun 2 is a nice experience for those who like the Total War formula. If you’ve played Medieval 2 or Empire before, you can pick up the game pretty quickly. However, if you aren’t a fan of Total War games I don’t think Shogun 2 has anything that would change your mind. I have quite liked playing it so far and I will probably end up putting dozens of hours into it over time. While the performance sometimes varies quite a bit, the game still remains playable and overall it’s enjoyable. Now, where did I put my wallet...I'll surface again in a couple of weeks. I already had this on steam . Liam, please use your "old" i7/nvidia System for later reviews. Mesa is still under heavy development and the Benchmarks are not meaningful for the majority of Linuxgamer. Arcanoxer Liam, please use your "old" i7/nvidia System for later reviews. This review, as clearly noted, is not done by me. Mesa is very relevant to Linux gaming, especially considering even Valve themselves now use it in SteamOS in place of AMDGPU-PRO. Mesa is also officially supported for this title. Even I will likely be switching to AMD for my next GPU upgrade thanks to Mesa, so it's even more interesting to me personally. Bet you'd never guess who's been looking forward to this all week but now can't play because he forgot to pay the internet bill. Oh well. rustybroomhandle Bet you'd never guess who's been looking forward to this all week but now can't play because he forgot to pay the internet bill. Oh well. Run to a place with wi-fi ? Can't you just download some more internet ? Aside of Rise of the Samurai and Fall of the Samurai, are all the other DLCs only intended for multiplayer? Is there a way to get only the DLCs from Feral's store if I own the game already? Total War games have always been a bit of a pig. Curiously, Total Warhammer seems to be the best running of the bunch even though it's the newest.